A couple of days ago I wrote about the two comics I’ll be debuting at the MoCCA Art Festival this weekend. I also wanted to mention a work of mine that, depending on how you look at it, is nearly eight years old—A.D. : New Orleans After the Deluge. (The web version appeared on SMITH in 2007–2008, the hardcover came out in 2009.) 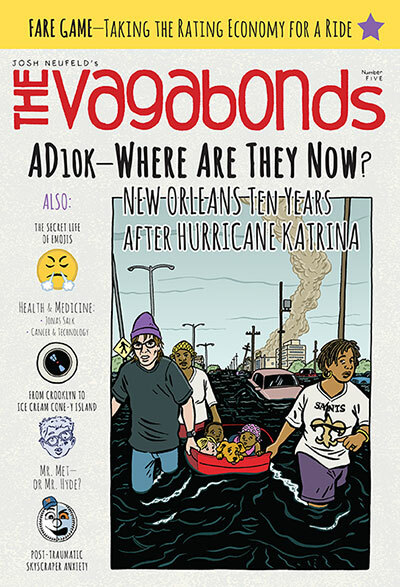 Believe it or not, the tenth anniversary of Hurricane Katrina is coming up this August, and it’s an event whose repercussions continue to resonate. Apparently, the book continues to resonate as well: just this month, I’ll be traveling to Amsterdam to speak about it and some of my other comics reportage at a narrative journalism festival. The week after that I’ll discussing A.D. with students at a college in Boston who’ve been studying it during this school year. 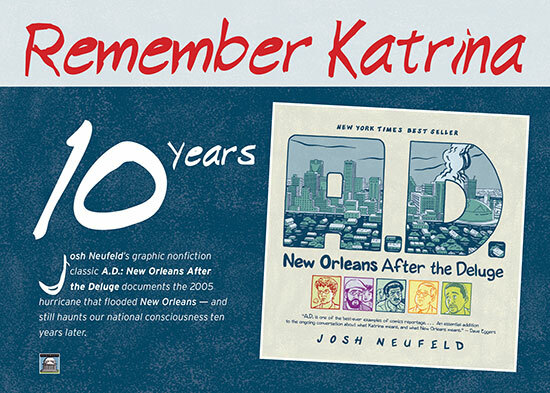 To commemorate the upcoming anniversary of the hurricane, my publisher Pantheon put together a special oversize “Remember Katrina” postcard, and I’ll be signing copies of A.D. at the Pantheon table on Saturday at MoCCA. Look for me from 2-3 pm at table 405.